Texas own Sisters on the Mat club led by Coach Monica Allen will take a bus load of the top Texas Women Wrestlers to Independence Iowa to compete in the Mat of Dreams Girls Conflict for Charity. Saturday Oct 13 will be the individual tournament and Sunday will be the Dual tournament. This tournament is High School, Middle School and Elementary Both events are on trackwrestling. 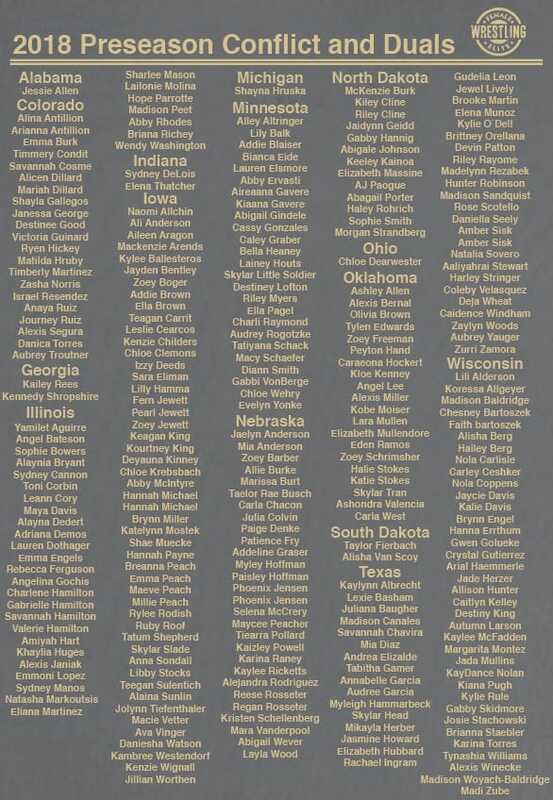 Below is a list of the States and high school girls participating in this years event where they will try to better their last years medal count of 17. 2018 Conflict for Charity proceeds will be donated in honor of Coach Mike Duroe to help children with cancer. Duroe has coached numerous different colleges and institutions, most recently Cornell College in Iowa. He has also been an instrumental part of the Hawkeye Wrestling Club and USA Wrestling. He was on the men’s freestyle coaching staff at four Olympic Games in 1996, 2000, 2004 and 2008. Duroe lost his battle with cancer this past July. Super 32 Results, Lawler takes 3rd.